I'll have you know that, without a car, living in Orange County as I do, and having to make a late night journey, by bus, and bike, into LA, took some planning. Who covered that famous day and year. I will stop for breakfast, but not at the golden arch. Ready to ride thru a dangerous place keeping eyes open to see. For no-one can touch me, on my steed, or cause me harm." Ready to take him to the beach. Actually my journey began around 1230am, and Nikita just looked up, yawned, licked my hand good-bye, and went back to sleep. I had planned to get off the 2nd bus at a part of Martin Luther King Blvd cut off from the main MLK, near 41st, at 3am, ride west on 41st, and a couple other streets, to re-connect with MLK, and head to the USC Campus. 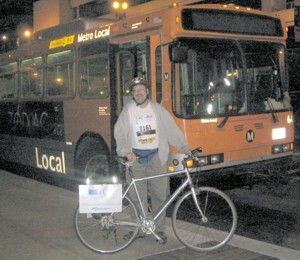 It was a shorter ride than going into Downtown LA, and dashing south, 45 minutes later. Alas I could not tell where 41st was, and so played it safe by going into Downtown. As I got my bearings I saw a fellow cyclist who, it was clear to my, um, well-trained, 4 eyes, was headed toward the Bike Tour. So I followed him, and a couple of blocks later caught up with him. 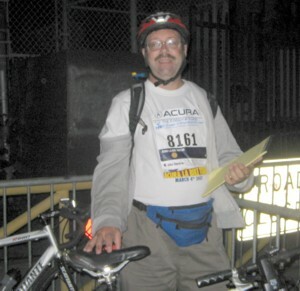 After confirming he was heading my way I introduced myself and, as we rode down Figuroa, we chatted about Blogs, bicycling, and the fact that he was going to be doing the marathon after riding the bike tour! Yesterday, a comment was left to one of my reports, and it was then that I learned the name of this brave individual, and the fact that he is a fellow blogger who, among many other things, writes about cycling. William Campbell, writes the Blog called [Sic] ( Yes, just like that! ), and is based in LA County. His reports on his Marathon Exerience over 4 posts, with pictures, beginning here. In just over a year as a blogger he has a collection of 73 posts on cycling, and counting. 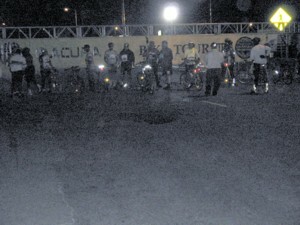 Once there, I went off to check out the quality of the Porto-Potties before heading over to the starting line. 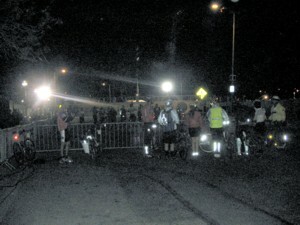 At 4am, people were just beginning to arrive, and one could be forgiven for thinking that there was no-way 15,000 bicyclists would be in this, several block long, staging area by the start of the ride at 550am. Over the next 2 hours I contented myself with taking a few pictures, and talking to my fellow cyclists about the ride, and about The Cycling Dude. In the process I helped an Hispanic guy, with limited English, figure out his camera so he could take a panoramic shot, took a couple of photos of an African-American cyclist, and 1 of a Caucasian mother, and her son. 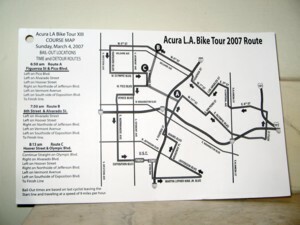 Yup, not only is the tour of the city a multi-cultural look at LA, but so is the make-up of the ridership each year. I had a great time checking out the variety of folks, and the variety of bikes, from tandems, and recumbents, from fixed-gear to beach cruiser, from mountain bike to road bike, and hybrid to racing bike. Whole clubs came out in force, the main one being, of course, the Los Angeles Wheelmen, who always help lead the ride as it gets underway. 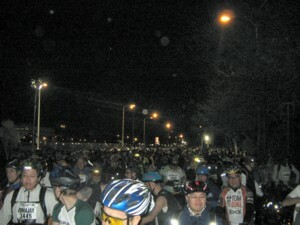 As darkeness gave way to dawn, sure enough, 15,000 riders gathered and, as the Star Spangled Banner was sung, eagerly prepared themselves for the journey ahead. 21.6 miles beginning with a jaunt down MLK, then into the Garment District, over to Boyle Heights, then back downtown for a look at the Jewelry District before heading west, then south, in the KoreaTown area, and back to USC. Next up: The ride gets underway. Wow what an awesome experience, thanks for sharing.